"I remember when I first arrived in America. There were so many lights, I thought they were all for me!" Barry Levinson's Avalon is one of those personal projects that goes to the core of a certain issue or situation. In this case, the subject is the roots that a family grows over time. Not everyone may have a family as large and as close as the people portrayed here, but just about anyone with at least a generation or two of relatives may find this familiar territory. As Avalon opens, Sam Krichinsky (Armin Mueller-Stahl) is telling the children—the newest generation of his family—the story of how he came to America in the early 1910s. He relates to them how his brothers managed to put together a business in their new world. Settling in Baltimore, their Jewish roots drove them to save money to bring over as many other relatives as possible. The large house into which they settled was part of the Baltimore neighborhood known as 'Avalon.' This story is told over Thanksgiving dinner, at which almost the entire family is present. The film focuses much of its attention on the current generation of this family who are in the process of setting up their own businesses and opportunities. Jules (Aidan Quinn), Ann (Elizabeth Perkins), and the boy Teddy (Elijah Wood) comprise much of the focus, but every member of the family plays an important role. Many elements pop up here, from Jules attempting to start a business selling televisions to how modern technology begins to erode their tight, Jewish family ethic. 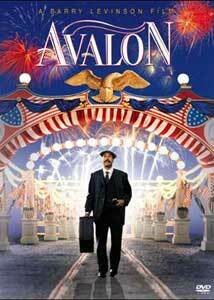 Avalon is a very well-crafted tale of an immigrant family making America their home, but at the same time it has a meandering nature. There really is no solid structure and no real, central plot. We simply see many events in the life a family play themselves out, but I couldn't really get emotionally attached to the characters since it moved so fast and in many directions. In this sense, perhaps Avalon is too personal, for it seems to be very much inspired by Barry Levinson's own family experiences and assumes that we all have similar roots. Another minor aspect that bothered me was the almost 'manufactured' tragedy in the film. It seems that virtually no member of the Krichinsky family is spared some heart-wrenching horror they must contend with. Of course, the evolution of a family would involve tragedy, but the amount here seems a bit excessive, almost as if Barry Levinson was attempting to surgically extract tears from the audience. This story doesn't need to be quite so bittersweet; it could make do with simply being itself. Despite its flaws, Avalon is still very much a film about the European immigrant experience and how many of us often forget the far-reaching pasts of our lineage, whatever it might be. Certainly Avalon stands out as one of the few films about multiple generations of a family that isn't somehow related to organized crime or an epic, war-oriented story. Image Transfer Review: At times, the 1:85:1 image appears a bit soft and hazy, but overall the transfer is enjoyable. Colors are nice and vivid; black level is very sharp and deep. On occasion, some source flaws show up, mainly in the form of stains and scratches on the negative, but they only last for a few seconds. Some of the darker, warmer scenes seemed a bit murky and bled just a bit. None of this kills the disc, though, and it's actually kind of nitpicking. Audio Transfer Review: The Dolby 2.0 Surround audio is about what you'd expect from a drama. While the music gets a bit of stereo treatment, the majority of the movie is firmly center rooted. Some ambience makes the film sound more wide, but the surrounds are almost never used for anything more than some slight addition to the on-screen action and the score. Other than language dubbing, the alternate tracks are the same. Extras Review: Other than a trailer and some simplistic bios, there's nothing on the disc. Although, there is an amazing 7 subtitle tracks. People usually complain about lack of an English track for the deaf, but this is definitely an interesting show of good faith from Columbia/Tri Star. A 2-page booklet contains some trivia and making-of information concerning the movie. Though a bit on the bare-bones side, Avalon makes a pleasing disc if you're in the mood for a story about family tradition. Recommended.